30 Years has just flown by ... and we are duty bound to catch up with each other again, rekindle lost friendships, maybe recount a few heady episodes of those forgotten days and basically have a really great time! I am writing to you because some of you on this circulation list (see bottom of email) attended a similar day last year, and we all agreed that it would be really great to meet up again ... and that we would try to get more people at this year's event ... making it even bigger and better - in fact, make a weekend of it. The school are kindly hosting us from 2pm on Sat 12 May for a few hours, including a tour of the school and some tea, starting in No. 1. After that, we will move on to a suitable drinking establishment, and then to have an evening meal together. It was considered that Sunday should comprise a mixture of sleeping, a walk (Black Mountains? ), or road cycling around the Herefordshire countryside and finishing off with a country pub lunch. As you can tell from the accolades at the end of this email, I have got this ... I will also be roping in Binny and Jules AC nee AA to help with the bookings - somewhat of a dream team events planning committee I think you will agree. If you have the email address of any 1988 OHs who would like to receive this email and join us, then please send it on to me asap or get them to join the Facebook Group set up by Jules. 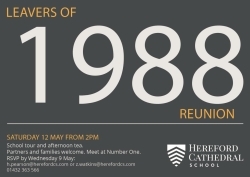 Foolishly, I am now teaching at HCS and said that I would help to organise this year's reunion to be the best ever, so don't let me down.